Join us on our day of action, April 24th, to #StopTheShock – learn more and find your local #StopTheShock wait-in here! What’s happening at the Judge Rotenberg Center? The Judge Rotenberg Center (JRC) is an institution in Massachusetts for children and adults with intellectual and developmental disabilities (I/DD), mental health disabilities, and learning disabilities, including many autistic people. The people held at the JRC are disproportionately people of color. The Judge Rotenberg Center tortures some of the people living there using an electric shock device called a Gradual Electronic Decelerator (GED). Children and adults at the JRC are forced to wear the GED on their bodies. Using a remote control, someone else can use the GED to give an electric shock to the person wearing it. The JRC uses the GED as an “aversive:” they use the pain of the electric shock to punish people for doing certain things. To learn more about the JRC, click here. Scroll down to learn what YOU can do to #StopTheShock. On April 24, 2014, the The Food and Drug Administration (FDA), the government organization in the United States that decides what kinds of medical treatments can be used on people, held a hearing that led them to conclude that there is no way to use the GED without significant harm, and recommended a ban. Since then, they have drafted final regulations which would ban the use of electric shock devices as aversives. In December 2018, the FDA released their Unified Agenda, which said that they were working on finalizing the rule. Over the past 5 years, your advocacy has been crucial to making it this far. You have talked with your elected officials, attended protests, sent letters, signed petitions, and spread the word on social media. We are so close to ensuring that no more disabled people are tortured with the GED at the Judge Rotenberg Center. But the FDA still hasn’t put the ban into action. On April 24, 2019, it will be 5 years since the FDA held their original hearing. 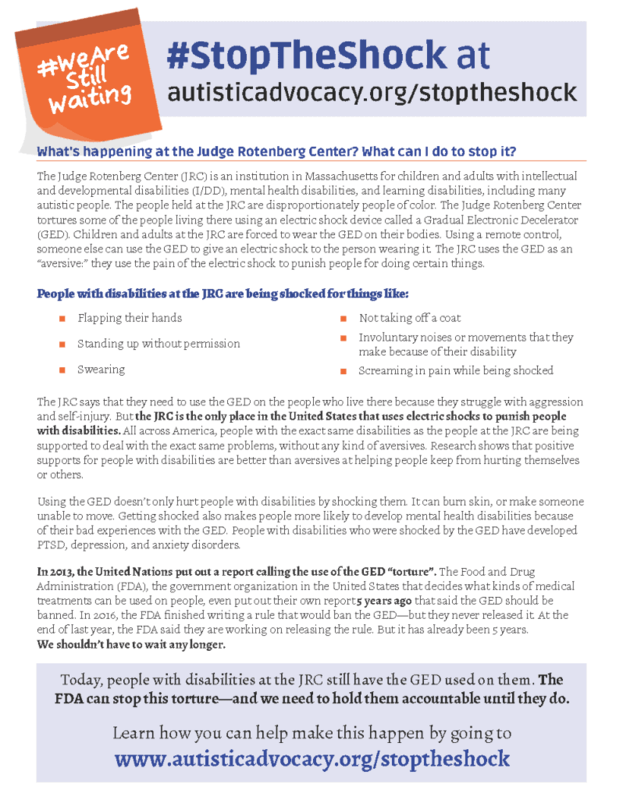 We are still waiting for the FDA to #StopTheShock, and we need your help to make the final push to make that happen. Whether you have 5 seconds, 5 minutes, or 5 hours, join us on April 24th to let the FDA know #WeAreStillWaiting. Take a selfie of all the places you are waiting to #StopTheShock, and post your photos on social media. Use social media to document other steps you are taking to #StopTheShock, like the ones listed below. Check out our social media kit for more ideas, and make sure to use the hashtags #WeAreStillWaiting and #StopTheShock! Make a post on Facebook or Twitter with information about the JRC, the GED, and how #WeAreStillWaiting for the FDA to #StopTheShock. You can use our sample tweets below! Call or send an email to the FDA and let them know that #WeAreStillWaiting for them to #StopTheShock. Call or email your Congresspeople asking them to send a letter to the FDA to encourage them to release the rule. 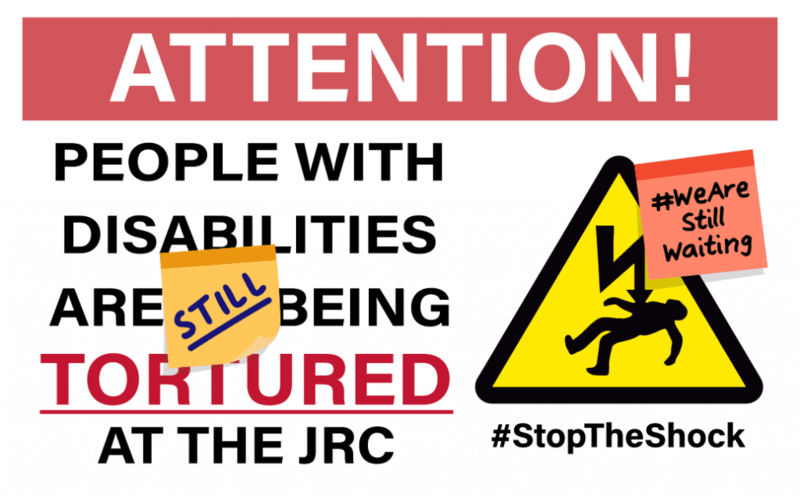 Organize a “wait-in” on April 24th to show that #WeAreStillWaiting to #StopTheShock! This can be anything from setting up an information table in a public place to hosting a letter-writing event, making a poster or art display in a high-traffic area, or asking people passing by to take a selfie and spread the word.To learn about hosting a wait-in, check out our guidebook here. If you are interested in organizing a wait-in, click here. You can check the list of events and find your local wait-in here. Write an op-ed or letter to the editor for your local newspaper letting your neighborhood know why it is so important to #StopTheShock. We provide a template to help you get started. Be sure to send us the article once it is published! Hold a virtual wait-in! Get a group of people together and livestream your calls, letters, and anything else you are doing to #StopTheShock. 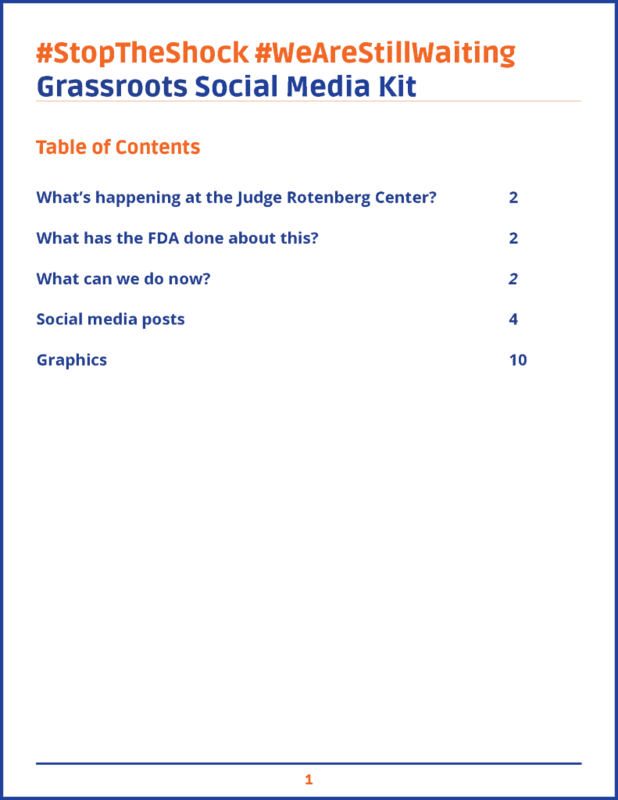 You could even organize a large social media campaign – make sure to use our social media kit! Your advocacy is what has gotten us here today, and your advocacy is what will make sure we #StopTheShock. We need you to show the FDA #WeAreStillWaiting.